Could everyone who hasn’t heard of this book please raise a hand? Yeah.. That’s what I thought. This series is very talked about and the new cover art definitely allures (most of) us to experience it ourselves. I had put off reading Shatter Me long enough so I finally caved in and finished it within two nights. The story. Shatter Me introduces us to a world where environment has been ruined by its inhabitants. This kinda hits close to home since I do agree that we should treat our planet more carefully but since it’s not an environment protection essay, I’ll leave it at that. Juliette is our girl and she is locked up in a pretty freaky institution. Why, you ask? She killed someone with her bare hands just by merely touching one. She’s been alone, silent with her thoughts for 246 days until now – the day she gets a cellmate. My thoughts. Of course I had heard of the unique writing style. It was hard to adjust to it and it was probably the reason I didn’t connect to Juliette that much, although I must admit, the writing style at the beginning of the book is genius. The more the book progressed, the more usual the writing became and mostly because of the changes inside Juliette. I liked how she opened up and what part Adam played in it. #TeamAdam. Oh, by the way, Kenji? He was introduced in the last third of the book but he became my favorite character nonetheless. At first I didn’t mind the lack of information about the society and how it came to be. Come on! It’s been so talked about – we’re destroying Earth yada yada yada. What more is there to add as an author? The lack of action didn’t bother me either at first since the writing was so unique and took me by surprise. However, now, 2 days after finishing it, I realize that not much happened action wise nor in general. Yes, we have our villain, our hero, our strong heroine, escaping, romance, fighting back etc. It’s nothing I haven’t seen though. I loved the writing. I think that it captured Juliette well. I loved her constant battle with her own thoughts. I loved the sequel. I am still not a fan of Warner. I actual don't even understand the whole Team Warner thing at all. He's a murdering psychopath. I love Kenji. Even if it's not possible, I am Team Kenji. Adam gets on my nerves in the second one. He needed to man up in my opinion. Great review. I'm sorry you didn't like this one more, but at least you didn't hate it. I'd bea 100% team Kenji if it were an option. Too bad it's not.. I agree, I don't get the appeal of Warner. He's a psycho! Yeah.. At first I was somewhat blown away by this book, but then.. It felt so ordinary afterwards. I hope I'll enjoy the sequel more. I hear so much about the writing in this one. Some people love it and some people hate it, it definitely seems like it's a very polarizing aspect of the book. I am definitely curious to see how I feel about though for some reason this one just hasn't ever really interested me. Maybe one day I will pick it up, one day! The writing was really different. One may hate or love it, but it IS different and totally unique. I hope you'll give it a chance - it may work for you. Ha. I may just wait until the third one comes out as well. Adam all the way for me since I just cannot imagine myself being a Warner lover. It's just too weird to love a psychopath. 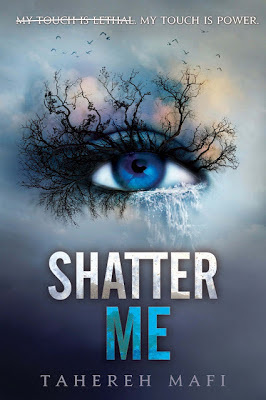 You know, I loved Shatter Me when I first read it, but the longer I was away from it, the more "meh" I began to feel. I think I'm mainly bothered by Warner being presented as a viable option for Juliette. It makes me feel icky. Ah, same here! It was quite ordinary compared to every other dystopian and nothing really stood out exept for the writing style. I agree on Warner. Thanks, hon! A lot of people seemed to have trouble with the writing-style in the beginning. I can't wait to see what's it like. It's a shame that something lacked for you, but I'm still curious to try it out :) Great review! For the cover, sure they're awesome looking but,... they make no sense. An eye? Why? I had a hard time getting through this one. I don't think it was the writing style but just a lack of connection to the main character, so I stopped halfway through. But my good friends finished it, and they said they don't understand the Team Warner praise. I think because Shatter Me made him seem like a villain, not a romantic interest at all. Maybe the second one will have that extra something that was missing for you on this one. Sorry you didn't like this one as much as you'd hoped. I wonder if hype played a factor? I read it right when it came out, and hadn't heard as much about it. I really loved Adam and Juliette, but I'm curious if you continue the series and what you think of them in the next book. Juliette was harder for me in Unravel Me. I think the writing makes this book unique, but you're right, there are elements that we've seen before. Very thorough thoughts, though! I just finished this book the other day, and I really loved it! The writing style is great. This is my first destopian* so I think it was a good one to start off with because it was mainly focusing on the world building.